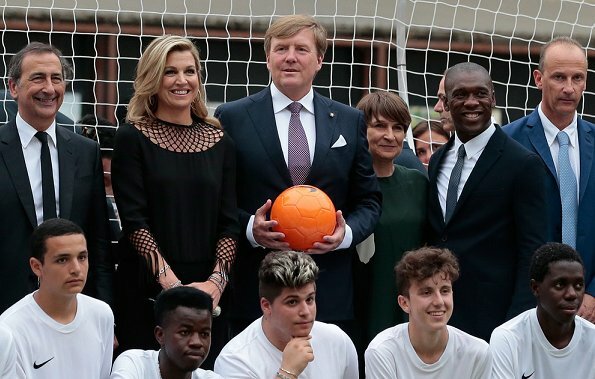 Yesterday, Queen Maxima and King Willem-Alexander of The Netherlands during the 3rd day of the 4 day state visit to Milan. 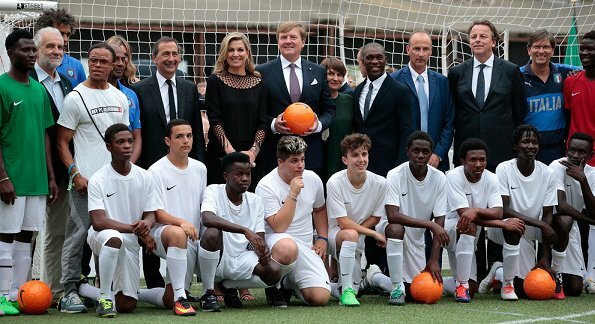 On June 22, 2017, Queen Maxima and King Willem-Alexander attended a Football Clinic: for integration organized by Italian Football Federation at Piazzetta Reale in Milan, Italy. oh no, that´s no good either. Not good - an ugly dress that is inappropriate for the event. 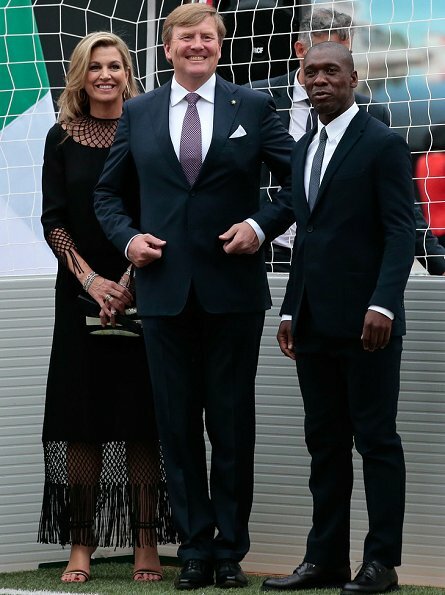 When I saw the neckline, I thought, okay why not?,(although it shouts rather Cocktail bar than football).... when I saw the sleeves, I thought, please not!, when I saw the hemline, I thought, 'Oh my gosh'!! 😂😂😂 Maybe she wished she hadn't also! La reine est allée ensuite à un dîner officiel avec cette robe ! Les franges des manches doivent tremper dans l'assiette ! Well, contrary to most of you, I love this dress. Nice hair too! The longer I looked at the dress, the more I began to like it and I changed my mind after I read this interesting article in Vogue about the Valentino Spring Collection 2016, which was inspired by African Arts and Styles merging with traditioal Roman influences. There are some really beautiful dresses in this collection. The dress looks actually good on the model with the african hairstyle and the Roman sandals. The problem is, that Maxima didn't get the idea of it and combined it with wrong accessoires and is wearing it with a wrong attitude. The long wavy hair, the jewelry, the clutch, and worst of it the same old stiletto sandals destroy everything the dress could express. Agreed on the sandals ruining the dress. Accessories in general, but I particularly dislike the stilettos. She has indeed an overpowering personality. The king seems to be just fine with that, and it's very likely one of the reasons he was attracted to her to begin with. I am not sure that she is getting even more dominant, or the photos we see (which clearly only tell a part of the story) give that impression. Stop it Maxima make this sartorial disaster go far far away or dump it in the nearest dusbin! That outfit should never have been concieved let alone stitched and now you have forced it on us! Oh the nightmare of it all! Hair looks nice, dress isn't quite my taste. Je n'aime pas du tout cette tenue. Pas très flatteur pour ses jambes. Nothing about this look defits the occasion ! Again,as with yesterday's dress, it looks more like something you'd thrown on if you were on beach or poolside. The horror! The horror! After seeing that eyesore I miss yesterday's poolside-party dress. Although somewhat too informal for the event it was summery, fresh and becoming. Trousers would have been more appropriate. Sometimes Maxima can be way overdressed and she looks out of place. Like when she wore heels to visit a farm. Well, even Valentino can create a dress that looks like a fishnet. It is a no for me. Also not very adequate for the event. The hair much better, and her smile as engaging as usual. So it appears... and yet when the designs were done by Valentino in the past he would never have done this kind of thing. It's not typical of Valentino style IMO. hahahahaha!!! Must admit scary!! hahahaha!!! only she can do this. Love the dress and it just suits the Queen's personality. One of the worst dresses she has ever had. Better luck next time. Also those carrot sowing shoes (my hubby´s comment to such heels) are out of place. Hair looks very good to Maxima´s loose hair day.